Kerianne A. Strachan focuses her practice on domestic and foreign trademark prosecution, clearance, enforcement, and brand protection. She counsels clients that include Fortune 500 corporations, multinational manufacturers, middle-market ventures, nonprofit organizations, small businesses, and start-ups. They rely on her to help develop, promote, and protect their brands in a wide range of industries and sectors, including consumer products, household appliances, retail, and educational services. Kerianne leverages her diverse background in business and marketing to better advise clients in supporting their brand management and economic goals. 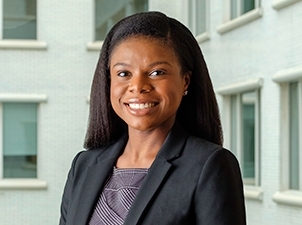 While attending Tulane Law School, Kerianne served as an extern for the Honorable Bernadette D’Souza of the Orleans Parish Civil District Court. Kerianne was also selected to work as a law clerk with the Tulane University Legal Assistance Program, where she was subsequently promoted to director, charged with managing the provision of legal services to Tulane University students, staff, and faculty for two years. In addition, Kerianne volunteered with The Ella Project, where she helped local musicians and artists in the New Orleans area with various pro bono legal services, including copyright and trademark issues; contract preparation, negotiation and review; and other entertainment law matters. Drafts office action responses for publication of marks identifying goods and services for a variety of clients. Prepares cease and desist letters for distribution to potential infringers of a national client recognized for its well-established slogan in educational services. “Doe v. Backpage.com: The United States Court of Appeals Further Extends Immunity for Internet Service Providers Under the Communications Decency Act,” Tulane Journal of Technology & Intellectual Property 19 (Fall 2016).